MSPs have unanimously backed the general principles of the Climate Change (Emissions Reduction Targets) (Scotland) Bill. The Scottish government confirmed it will make amendments to the bill a stage 2 after fresh independent advice on targets has been published. 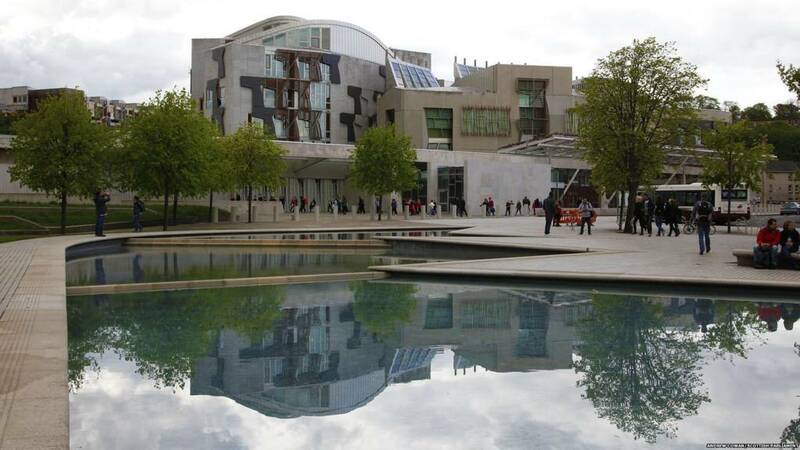 A coalition of charities has called on Scottish ministers to strengthen the bill by setting a net-zero emissions target in the legislation. New advice from the Committee on Climate Change is due on 2 May. Community Safety Ash Denham says the law has not always taken stalking seriously. Ms Denham says this parliament led the way in 2010 with a specific offence of stalking being created by the Criminal Justice and Licensing (Scotland) Act. The minister reminds the chamber that this year's awareness week is stalking as a public health issue. She points out that Scottish government funding supports over 5,000 workers responding to psychological trauma. The minister says she is very keen to see the detail of Rona Mackay's anti-stalking member's bill when published. Zoe Dronfield was almost killed by her ex-partner, who started stalking her when she ended the relationship. After she went public with her story, 13 other women said they had also been victims of his controlling behaviour. She is now campaigning for a register of stalkers, alongside the national stalking advocacy service, Paladin. Labour MSP Rhoda Grant says the difficulty of defining stalking can make it difficult to legislate against. This is because seemingly innocuous acts can take on a threatening angle, she explains. But with thanks to Ann Mould of Action Against Scotland, we achieved it Ms Grant states. Tory MSP Liam Kerr notes that recorded incidents of stalking have doubled since 2012, while only one in ten women actually report it. He goes on to highlight the difficulty victims have faced when trying to report stalkers. There is no dedicated strategy or dedicated funding for tackling stalking in Scotland, he highlights. I hope this Parliament can make substantial progress going forward, he concludes. Background: What are stalking protection orders? On 15 March 2019, the Westminster Stalking Protection Bill received royal assent and became an Act. The bill introduced Stalking Protection Orders (SPOs) to improve the safety of stalking victims. Stalking protection orders (SPOs) aim to "improve the safety of all stalking victims by giving police the authority to address the danger that perpetrators pose while they gather more evidence". "SPOs will allow police to apply to restrict perpetrators actions, for example stopping them from contacting or getting to close to their victim." More information is available from the Suzy Lamplugh Trust. Ms Mackay explains she is in the process of introducing a member's bill to allow the police to introduce a stalking protection order directly to a civil court on behalf of the victim. Her bill would not only relate to stranger stalking, as with legislation down south, but also stalking by those known to the victim. explains the SNP MSP. "We must stem the tide of this insidious crime now." SNP MSP Rona Mackay begins saying stalking is a horrible, insidious crime and "strikes fear into the victim's heart." Ms Mackay cites alarming news that incidents of stalking have doubled in the last five years. It is a vastly under-reported offence explains the SNP MSP. She quotes the latest figures from the 2017-18 Scottish Crime and Justice Survey, totaling 1,376 incidents in Scotland. Ms Mackay praises the work of Action Against Stalking set up by Ann Moulds. The SNP MSP, with the permission of Ms Moulds, details her horrific personal experience which led to her setting up the charity. A backbench MSP called for a new law to give victims of stalking greater protection from the "incredibly serious crime" last May. The SNP's Mairi Gougeon announced her intention to bring forward a bill that would introduce new stalking protection orders. Ms Gourgeon was appointed as a Scottish government minister not long after, so her colleague Rona Mackay is to take forward the bill instead. Currently, people can go to the civil courts to have a non-harassment order taken out against a stalker. But it is then down to the police to apply for a stalking protection order. SNP MSP Rona Mackay is leading a debate to highlight Stalking Awareness Week. It takes place from 8-12 April and seeks to raise awareness about the impact and seriousness of stalking. MSPs also back the changes to the code of conduct for MSPs. MSPs unanimously back the general principles of the Climate Change (Emissions Reduction Targets) (Scotland) Bill. The Standards, Procedures and Public Appointments Committee is proposing a change to the MSP code of conduct to tighten leaks to the media. The committee agreed to consider this last November following concerns about confidentiality and the disclosure of documents to the media. The proposed new code of conduct can be found here. Climate Change Secretary Roseanna Cunningham insists it is right that Scotland responded to the Paris Agreement quickly via this bill. But she accepts this has led to a situation where stage 1 is being debated before the CCC's advice has been published. "I'm listening carefully to all credible sources of evidence," says the minister. Those calling for us to go beyond the advice of the CCC must consider what that would mean for the evidence-based approach more widely when it comes to targets, she adds. This bill will provide us with the framework to deliver on the second half of transition all the way to net-zero, Ms Cunningham states. Tory MSP Donald Cameron says it is clear today decisive action is needed and he agrees with WWF who say climate change is the biggest crisis facing the world and swift action is required. The Tory MSP tells the chamber the agricultural sector is willingly adapting to tackle climate change and he warns against overburdening the livestock sector. He prefers a voluntary approach from farmers, rather than legislation. The Tory MSP pivots to the impact of climate change around the world. "It is not only our duty to make changes - it is also our moral duty too."